Retain the moisture of theouter surface of the lens. High-molecular ingredients (sodium hyaluronate, etc) and low-molecular ingredients are combined, keeping the lens moisturized from inside out. 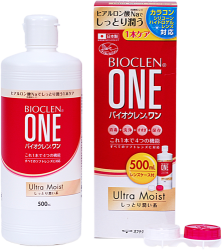 BIOCLEN ONE is able to meet the primary criteria of stand-alone test by adjusting the variety and composition of the moisturizing ingredients. 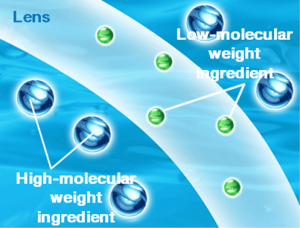 BIOCLEN ONE Ultra Moist is able to suppress adverse effects on corneal cells through its ingredient composition. Hence, it is also recommended for use on silicone hydrogel contact lenses (SHCL), which has high tendency of absorbing ingredients like disinfectants.